The main reason for my visit is the 38th Deauville American Cinema Festival. It may not be on the same scale as Cannes, but it still has a VIP guest list. This time, Liam Neeson and Salma Hayek are being honoured with their own beach huts. It’s the Norman equivalent of having your handprint set into the Hollywood Walk of Fame. A few years earlier, Angelina Jolie and Brad Pitt were invited to make their way up the red carpet to the Centre International de Deauville for a screening. As one of the most accessible film festivals of its kind, €35 will get you a day pass that will keep you entertained well into the early hours! 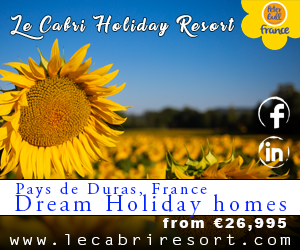 The jury and assorted French stars are put up each year at the luxury seafront Normandy Barrière hotel, a fact that is all the more obvious from the huddle of autograph hunters outside it. There’s a real buzz when someone connu does emerge, but I’d recommend you wait it out at the Star Café on Rue Hoche, where you can keep an eye on any comings or goings over a grand crème. As I’m debating whether or not to move on from that spot, a shiny black Porsche driven by the valet swings around the corner and people who were passing by start to move in for a closer look. Minutes later, a woman comes out of the hotel with a small dog in tow. I don’t know who she is, but it doesn’t matter – judging by the reaction, nobody else does either. But before I lose interest completely, a man in sunglasses appears behind his girlfriend and in the short distance between the hotel and his car parked outside, he is greeted by a barrage of autograph hunters waving pens and paper in the air. He even poses for a few photos with fans… one of whom has to fill me in afterwards. Apparently, Eric (or was it Ramzy?) is one half of French comedy duo Eric et Ramzy and has a new film to promote. Of course, if you want to keep a low profile here, that’s possible too. The underground passage between the hotel and the casino makes life easy. Actors aren’t the only big names in Deauville. At the end of the street is Place Yves St Laurent – the designer used to live here – and on Rue Lucien Barrière, leading off it, is a plaque commemorating the shop opened by Mlle Coco Chanel back in 1913. So where better to indulge in a spot of retail therapy? Place du Casino has it all, from Ralph Lauren to Louis Vuitton. I’d head for Hermès or Longchamp, if I could afford it. They have a horse/racing assocation, just like Deauville. Beneath shoppers’ feet are a couple of large mosaics, both featuring racehorses. The hippodrome itself is within walking distance and in the summer months the equestrian calendar is filled to bursting. At the annual yearling sales, young horses can change hands for a million or more euros. But at any time of year, there’s a chance to go and see the horses at the stables. In the morning, they come down to the beach as part of their daily exercise, where the salty sea water is said to have a therapeutic effect akin to thalassotherapy. Spa treatments for horses? It had to be here. On the other side of the river, Trouville’s pride and joy is its Marché aux Poissons, an impressive looking building that was destroyed by fire in September 2006 and only re-opened at the end of 2010 after a €6.2 million refurbishment. It actually took longer to to re-build than it did to build! Sebastien Saiter works for the family business, Pillet Salter, the oldest fishmongers housed within it. He is a well-known face and in the few minutes I spend trying to convince him to share with me the recipe used to make his AOC fi sh soup (he will only reveal that it contains shrimp), the regulars are queuing up to shake his hand or pat him on the back. There’s an informal seafood tasting bar set up outside, so I pull up a stool and prepare to taste his fish soup for myself with croutons and a mouthwatering garlic rouille. It is delicious! But Sebastien insists his crab claws are even better and arranges a great handful on a platter whilst trying to locate the DVD he wants to show me of his last fishing trip. Fishing boats are moored behind the market, where nets are being repaired by hand and boxes of fresh fish are being unloaded. Here on the harbourside is where all the fisherman would have lived. The houses with their spiral staircases have since been converted to flats, but there are still hooks beside the windows where the fish would have been hung out to dry. Elsewhere, by the boardwalk, there is some interesting architecture of another kind. When the largest villas were constructed, the owners all wanted to build one better than their neighbours. The resulting row of houses looks somewhat confused, even if each is beautiful in its own way. In Deauville on the other hand, everything is timber clad, painted the same colour and decorated with épis de faîtage (terracotta ornaments like birds or flowers) on the rooftops. 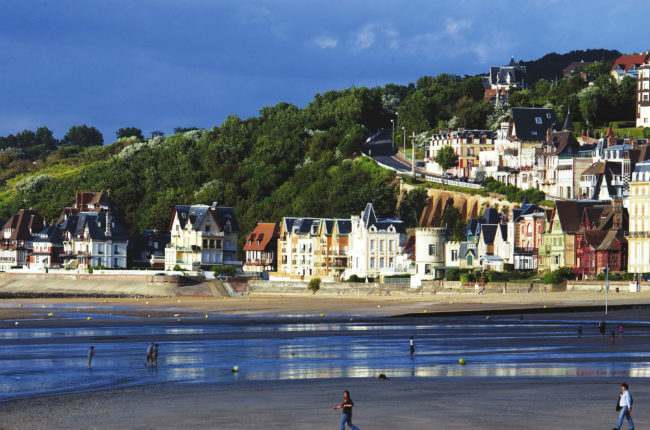 Like Deauville, Trouville also hosts an annual film festival, but in very much its own way. Off-Courts coincides with the Deauville American Cinema Festival. It celebrates French language film shorts from Quebec and encourages the public to get involved by making their own or just voting for their favourites. I gave Vends Chien Qui Parle, 10 Euros (Talking Dog For Sale, 10 Euros) full marks for making me laugh out loud and it actually went on to win a prize. Trouville is also home to brasserie Les Quatre Chats, that is so good it has brought Gwyneth Paltrow, George Lucas and Matt Damon across the river for something to eat. There are even pictures on the walls to prove it! The restaurant is owned by a man called Serge Salmon, who – along with his Old English Sheepdog, Sweetie – gives me the guided tour after dinner. On the stairs, we pass Serge’s hall of fame, a gallery of all those famous faces filled here. They obviously appreciate good food wherever it comes from, which makes me think that Monsieur Morny got it right when he developed Deauville. 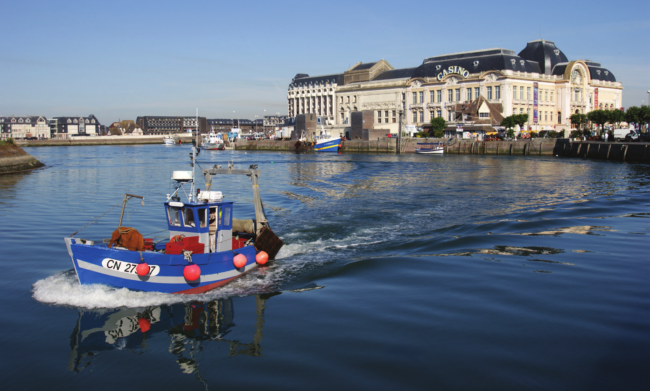 With its proximity to Trouville, what we’ve got now is truly the best of both worlds, glamour and luxury, fresh fish and friendly faces.